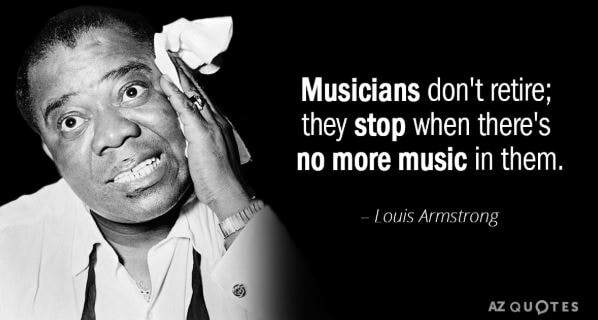 Louis Armstrong has been one of my favorite Jazz Artists ever since I can remember. He left school during the fifth grade to work because of the financial needs at home. "What a Wonderful World" was actually a flop when it was released in 1967. Louis used to give away laxatives as gifts, yes I kid you not. When he was 62 he made it to the top of the pop charts surpassing The Beatles. 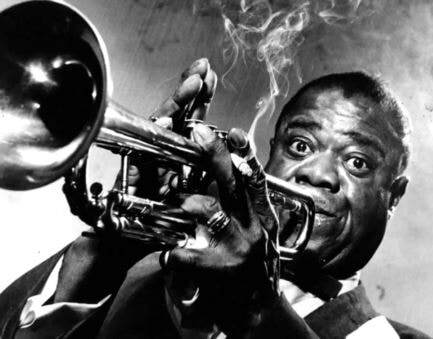 In a span of three years Louis Armstrong recorded 60 of the most influential records in history. 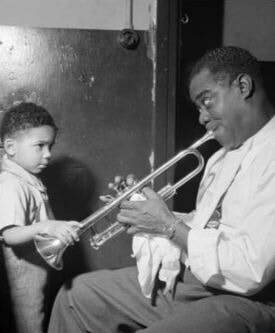 It wasn't until 1926 that Louis switched from playing the cornet to the trumpet. 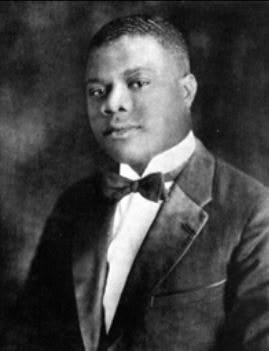 You may know this however I didn't know until our trip to New Orleans that the New Orleans airport is named Louis Armstrong Internationational Airport. My personal all time fave Louie Armstrong songs are as follows and in this order. Colorful Bouquet is one of the paintings I created for the challenge this week, rich in color just as the flowers mother nature created. When I was creating this painting I realized that I haven't created any floral bouquet paintings so far I should probably get started - we're half way through 2018. 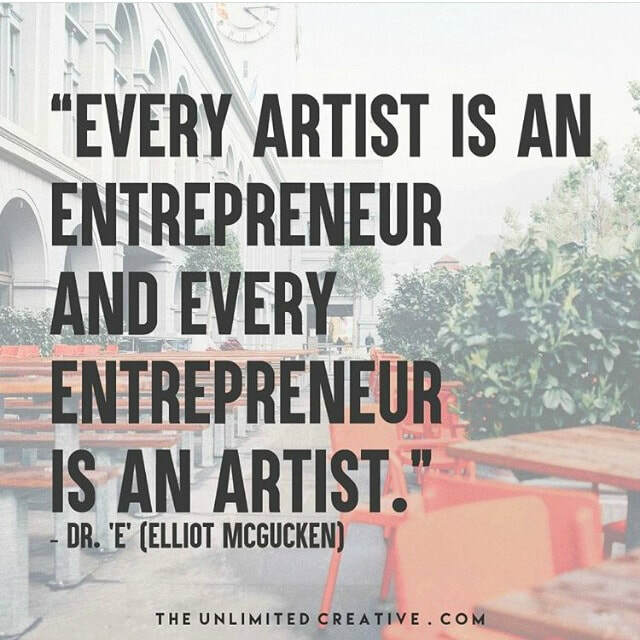 This post is to share my creative thought process and opinion based on my knowledge and experience as an Artist I am not speaking for all Artists' as each artist has their own creative process. I've been participating in a 7 day painting challenge this week and this is one of the paintings I created for that challenge. 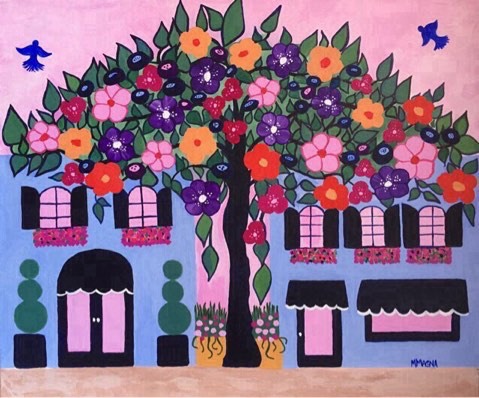 A painting of colorful flowers blooming from a tree as the sun rises and two birds rejoice as they soar into the sky with joy in celebration of a new day. 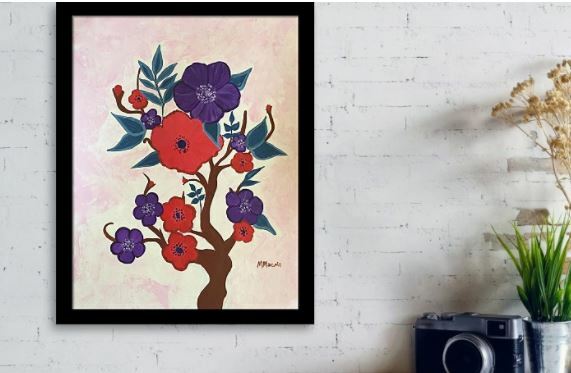 This painting has been sold but is available as a print in various sizes, professionally printed on acid-free heavyweight matte paper and archival inks. Check it out. When I created Little Respite I think I may have been creating the small cottage my husband and I dream of located in the country to get away and recharge. My dream cottage would have enough land for two Freisians like this guy here. 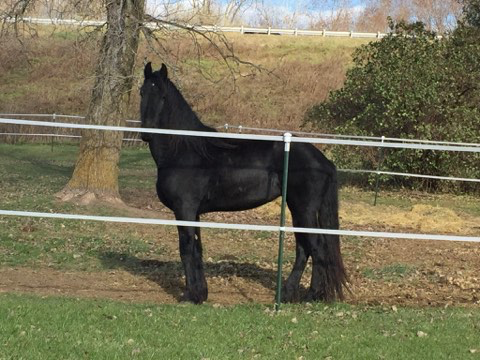 I absolutely love this breed of horse, I think they are beautiful, regal and stunning. They just take my breath away. It's my understanding that these beauties originate from the Netherlands. I haven't had the privilege to ride one but I intend to one of these days. This is one of my furballs... Have you ever looked at video clips on Instagram where there are like 6 adult cats or a mama cat and a bunch of babies. I want to know how these people keep their house clean? You look at their floors and there's never any cat hair floating around. I have hair in every corner of our house I'm constantly picking up hair around the corners and I only have two of these furballs, any suggestions let me know. 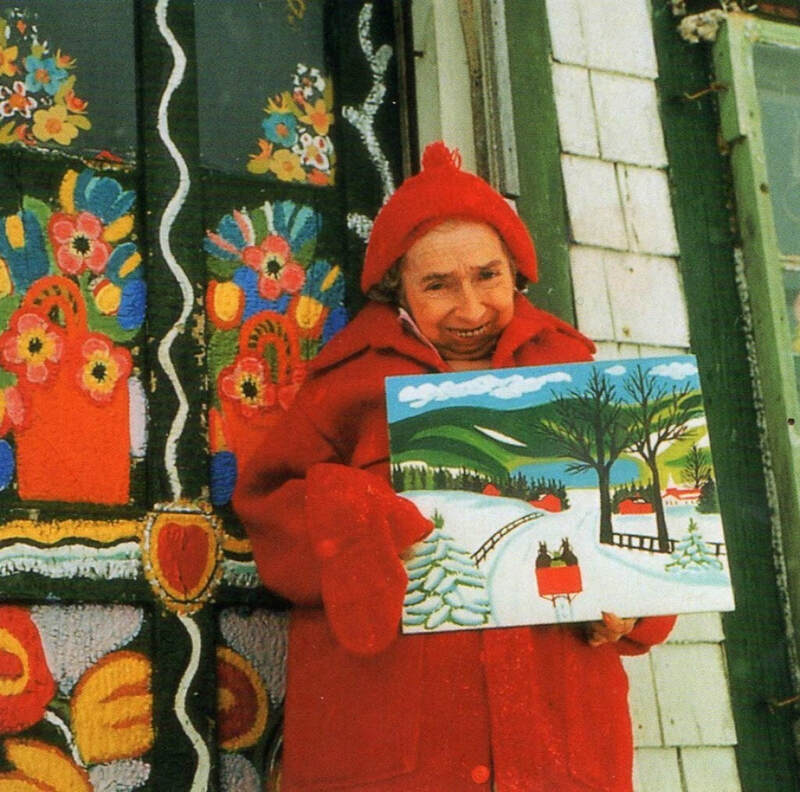 Maud Lewis is one of my favorite Artists. 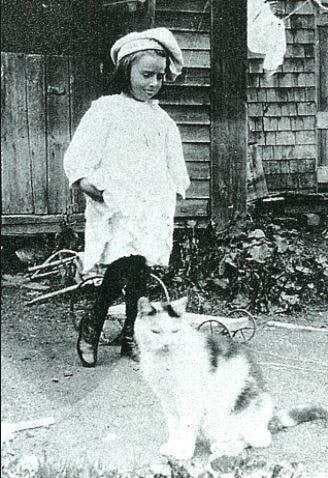 Maude as a Child with her cat Fluffy. Circa 1909. Picture courtesy of unknown. 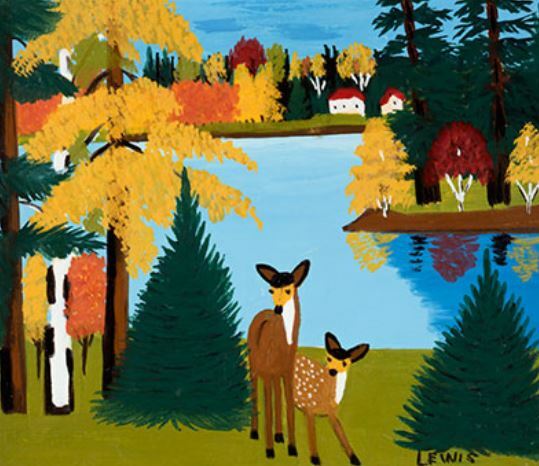 She was a Canadian Folk Artist born March 7th 1903 in Nova Scotia. 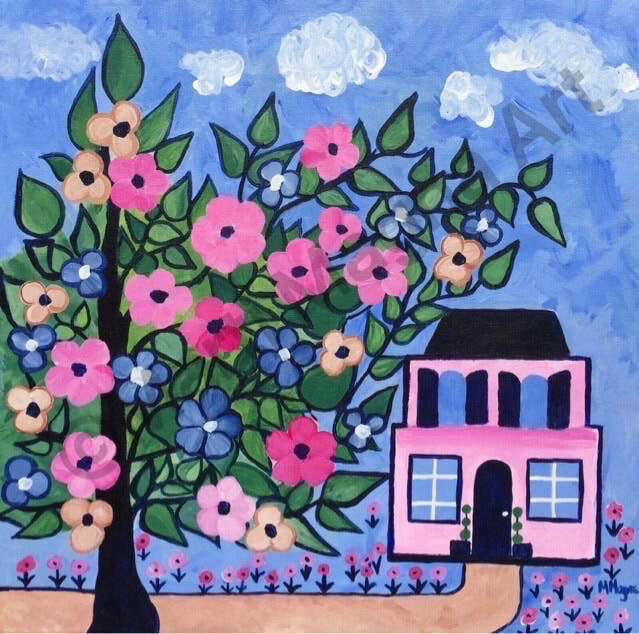 Her mother introduced her to watercolors when she was a little girl and encouraged her to paint regardless of the limited use of her hands and arms from the deformative juvenile rheumatoid arthritis. In 1938 she married her husband ( Everett ). 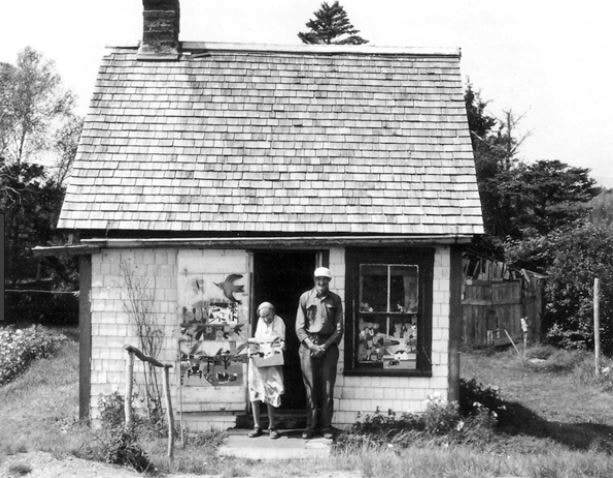 They moved into his tiny one bedroom house in Marshalltown, Nova Scotia. 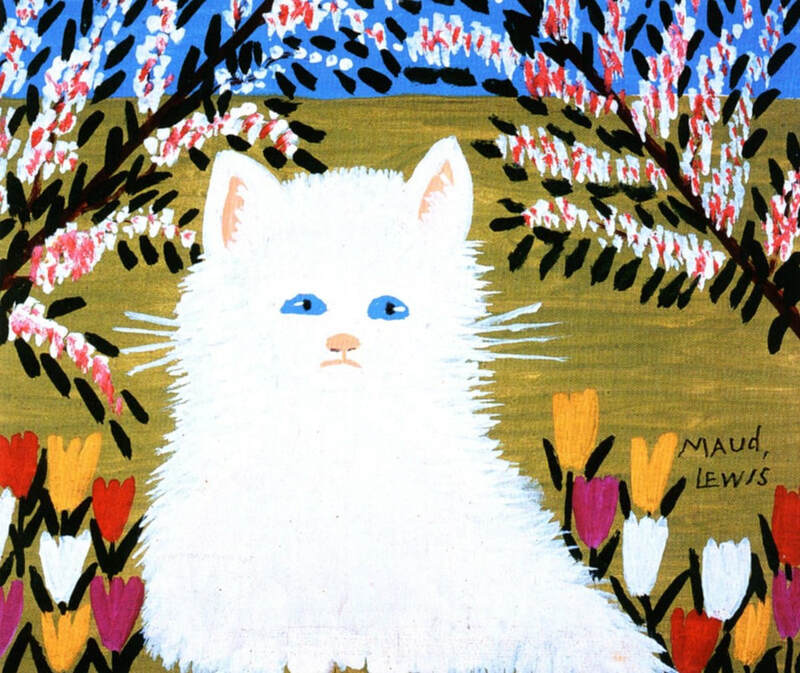 After they were married Maud started creating Christmas cards as she did when she was a child. 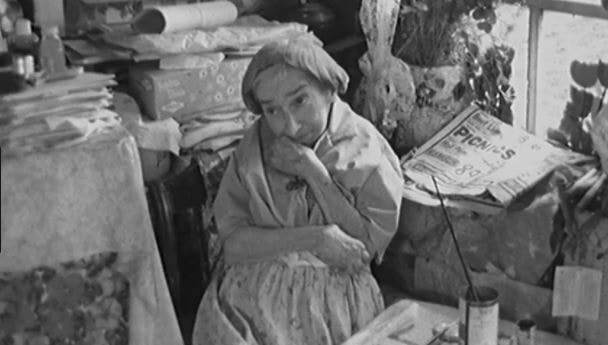 She would tag along with her husband who went door to door selling fish for a living while she offered her Christmas cards. Turns out her cards were a big hit. 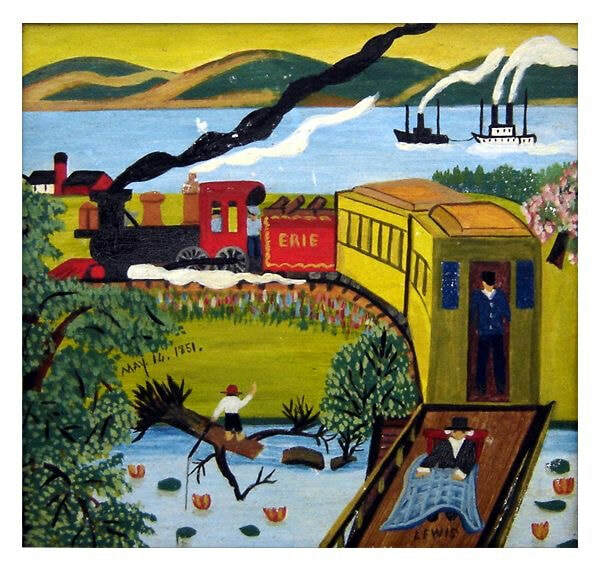 Her husband encouraged her to start painting by buying her her first set of oil paint. 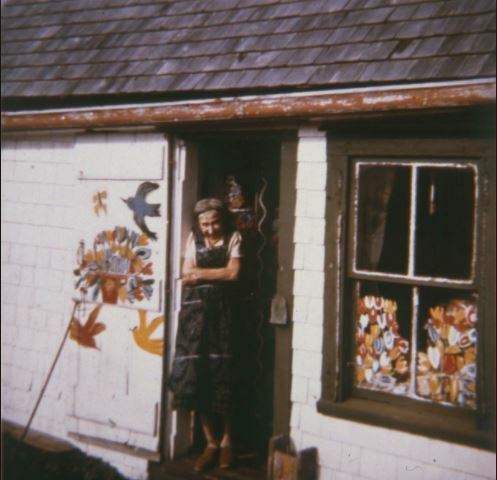 She painted on everything from cookie sheets, breadboxes even the walls and doors in their tiny house. 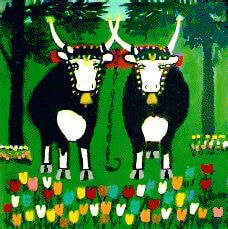 Most of her paintings are of outdoor scenes inspired by her childhood memories also dogs, cats and other animals. She never mixed her paint colors because of the restricted use of her arms so she used the colors of paint straight out of the tube and onto her canvas which was most of the time wallboard. 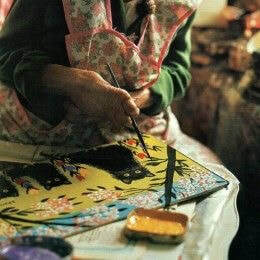 Between 1945 and 1950 people started stopping at her home as they were driving on the main road she lived on - she sold her paintings for $2.00 to $3.00. The last five years of her life she raised her prices from $7.00 to $10.00 even though she was encouraged to raise her prices she never did. She passed away in July 1970 at a young age of 67. 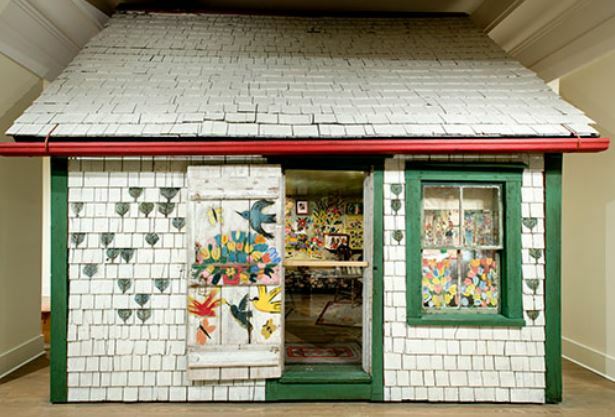 To preserve her tiny home that was now a piece of artwork in and of it'self was moved to the Art Gallery of Nova Scotia. On an online auction last year ( 2017 ) one of her paintings that was appraised at $16,000 sold for $45,000. A couple of auction sites that have some of Maud's work up for auction. 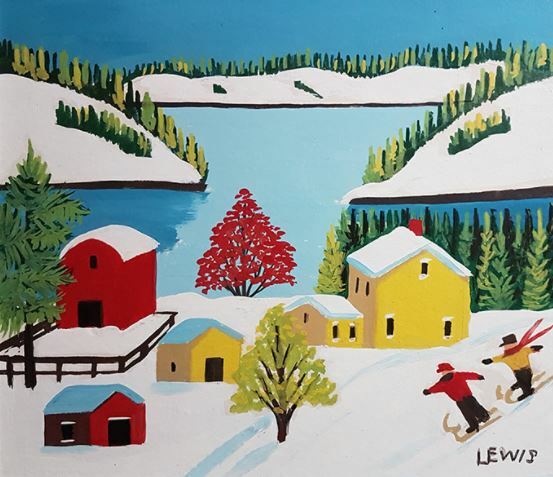 I hope you enjoyed a few highlights of one of my favorite Artists, one of my goals is to explore the most northern states in the North East and Nova Scotia although is part of Canada it's easily accessible to get to from there. It's been a while since my last post, I hate not being consistent sharing with you here but I'm good at getting sidetracked. I think it would be fun to share a behind the scenes to do list in another post. I wanted to share this pic with you, it's a picture I got from one of my collectors, she sent me a pic of Autumn, she framed it with a mat and she now has it hanging on one of her walls. 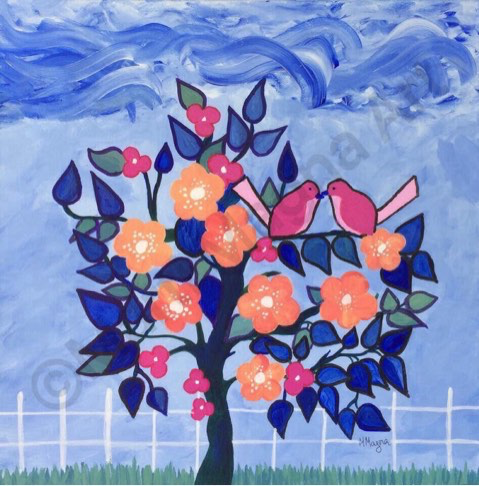 Just a reminder that even-though this original painting has sold you can still purchase a Print of this painting in a variety of sizes, as a print alone or with a mat and frame. This blue hued tree is so different from the color combination I'm used to. 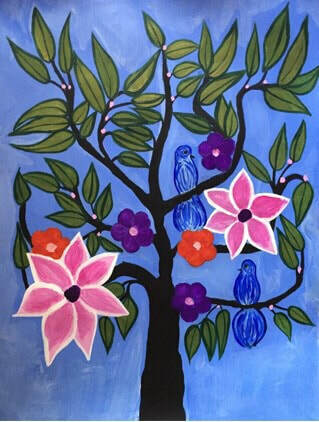 Have you noticed this tree has all the flowers painted in various shades of blue. 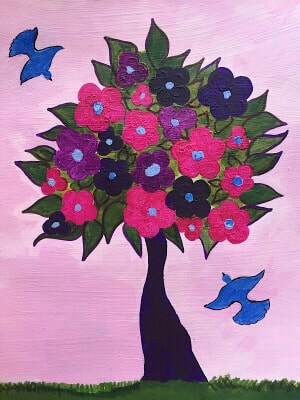 The colors I use together most often are blues, pink and bright or deep fuchsia's in this particular painting I infused a deep purple for some of the flowers they're dark enough to where they look almost black or navy blue but in this particular painting is all blue which for me is unusual. The majority of my custom orders lately have been inspired by my paintings on paper but created on canvas at the request of my collectors, which made me think I should mix it up a little. What do you prefer Paintings on paper or on the traditional canvas like this painting? ​Sending this painting to its new home Wednesday, my client didn't want to take a chance with it getting lost in the loads and loads of mail traveling through our postal system so I'm waiting until after Christmas to ship it. Although the Original has sold you can still purchase prints of the Original above just take a peek to see if you like one of these basic sizes or if you think you'd like a different size just contact me. Below is a small art print of the original above to give you an idea of what it looks like with a mat and frame. So to give you and idea of what a larger size would look like I added the pic below to give you an idea of what a larger than 16 x 20 inch Art Print would look like. 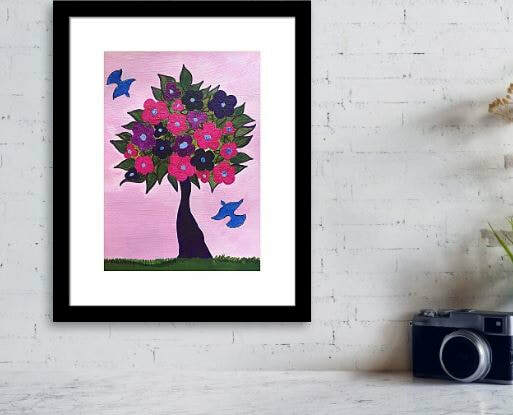 Once you have your Art Print all you have to do is drop it into a standard sized frame or you can take it to your local framer to have the Art Print framed and mated in which ever mat and frame best suits your decor..
How do you feel about birds singing first thing in the morning when the sun is rising. Personally I love it. Ironically I'm not a morning person but I absolutely love it when the birds are chirping and singing at the crack of dawn outside my window. 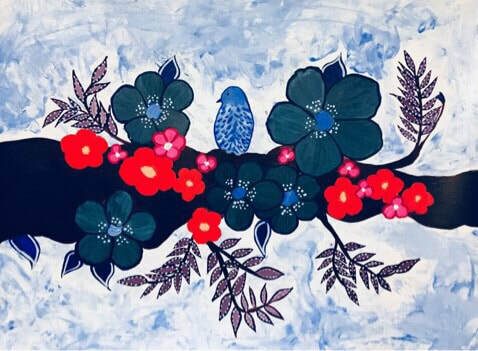 The inspiration for this painting came to me as the birds flew around chirping happily from the tree branches to our bird feeder and back to the branches enjoying their breakfast. I have three sizes of Brunch for Two as Art Prints available. 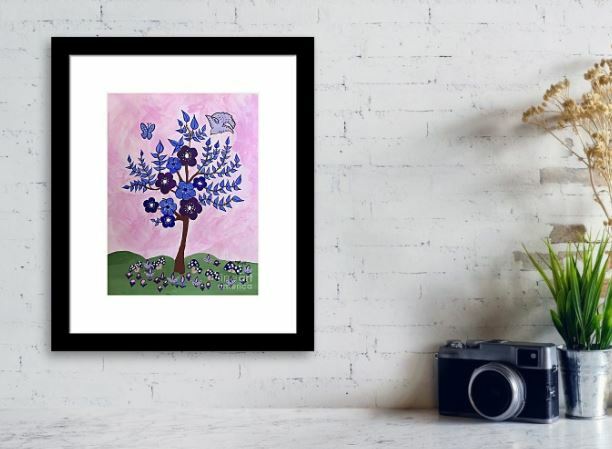 All Art Prints are professionally printed, I work with a printer specialized in creating Art Prints for Artists using acid free paper and archival inks. You can use a standard mat and frame or you can have your local framer frame for you. The most common questions and statements I get when I tell people I'm an Artist. Me: I'm a working Artist. Oh yeah just like those classes where you can drink wine while you paint. My niece wanted to take that up but I don't think she ever did anything with it. ​Me: Oh so that your hobby. Me: Yeah, this isn't a hobby I earn a living from the paintings my wonderful collectors buy. Other Person = Blank stare. Me: Just to give you an idea... I picky about my paint, I like knowing what its chemical structure is. oh I create my paintings to last a lifetime so I seal my paintings with a professional grade varnish which is probably the only part I don't care for especially since it requires I wear a mask. Other Person: Surprised look with a Blank Stare. Me: Oh, I won't bore you with all the other details like appropriate drying time, also temperature and humidity etc. The perception the majority of people have about Artists is that unless you're in an Art Gallery your not an "artist" and painting is just a hobby. The Art Gallery topic maybe a blog post for another day. In the end these conversations are always enjoyable, most people are very intrigued and I enjoy sharing my processes with them, a lot of these wonderful people have become collectors - needless to say I appreciate every one of them. Buy Original Paintings by Marti Magna, Artist. 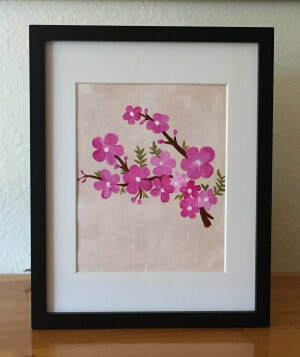 Hand Painted, Original Artwork, signed artwork, Buy Direct from Artist, Colorful Wall Art, Abstract Art and Floral's. 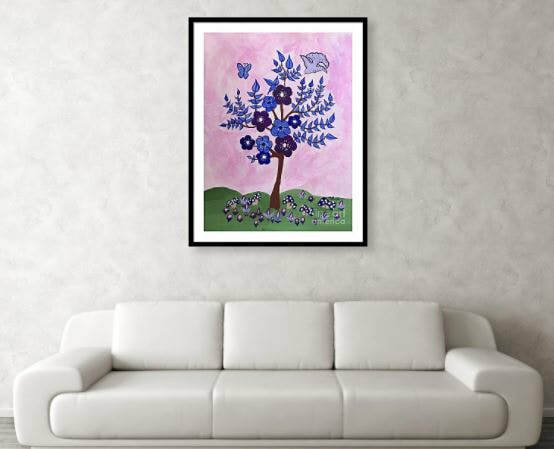 I have all of my Art Prints professionally printed and are created with acid free paper and archival inks for lasting results. Perfect for Holiday Gift's ready to drop into any 11 x 14 frame of your choice. 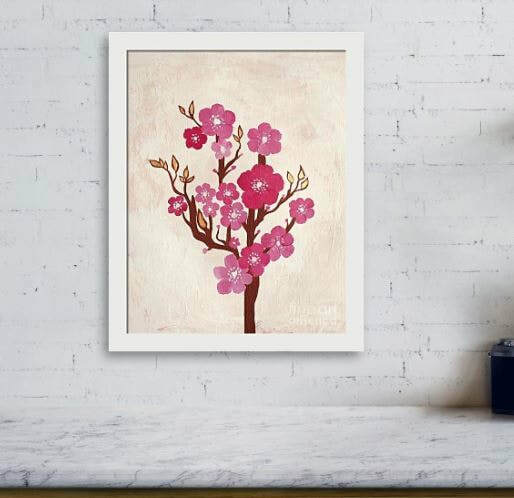 This is what the Blossom Tree Art Print in a different frame just to give you an idea of how this Art Print is interchangeable. All 11 x 14 inch paintings are $22.00 each with a $5.00 flat rate shipping for Priority USPS delivery. Quantities are limited, Contact Me with the quantity and your "mail to" address and I will send you a PayPal Invoice. Shipping deadline is the 17th of this month to ensure you receive your gift by the 24th of December. Feel free to contact me Contact me if you're interested in a different size or if you have any other questions. Buy Original Paintings by Marti Magna, Artist. 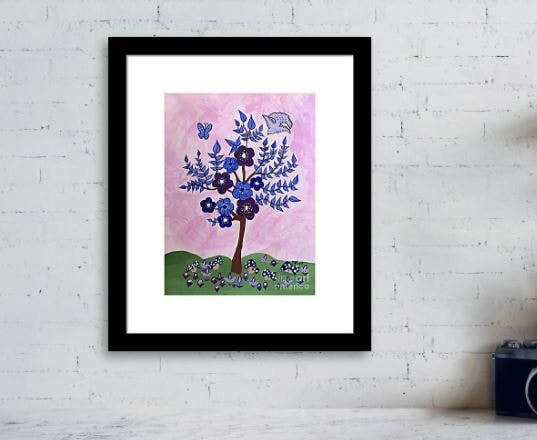 Hand Painted, Original Artwork, signed artwork, Buy Direct from Artist, Colorful Wall Art, Abstract Art and Florals. This is an Art Print of my Original Painting - Autumn, I have them professionally printed with archival inks. 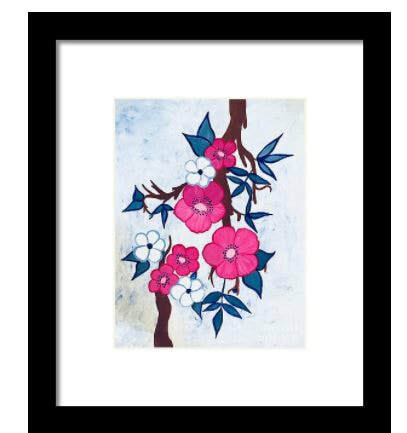 ​Perfect for Holiday Gift's ready to drop into any 11 x 14 frame of your choice. This is what my Autumn Print in a white frame just to give you an idea of how this Art Print looks in a different color frame. I personally package your prints and mail flat with a sturdy cardboard backing along with a tracking number. Quantities are limited, Contact Me with the quantity and your "mail to" address so I can send you a PayPal Invoice. So for this Holiday Season only I'm offering Prints of my Original Paintings. This offer is only through December 10th for both Abstracts and some Floral Paintings. All original paintings will be offered as 11 x 14 inch prints of my Original Paintings and are only $22.00 (plus tax if you're in AZ) with a flat shipping rate of $5.00 within the U.S. only. International orders please contact me for shipping rates and options. 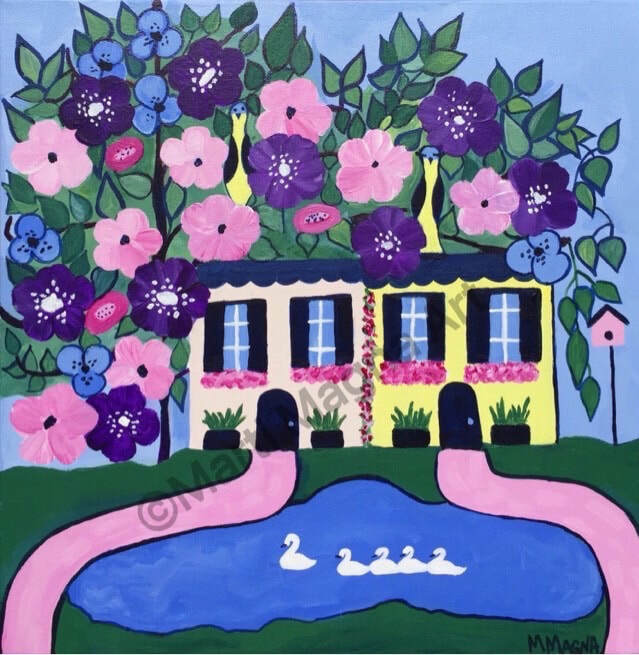 I only sell Prints of my original paintings when the Original Painting has sold, but because I believe everyone should own "real art" this is a great opportunity for you to get your hands on a print of a hand painted original painting. Each Print will arrive with a 1/4 inch border should you want to add a mat. You can get larger sizes please contact me directly to talk about other sizes. 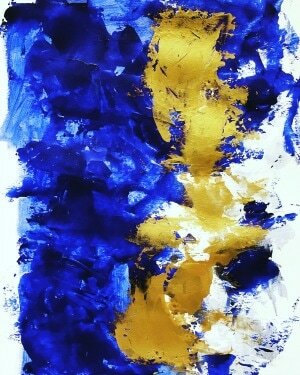 Buy Original Paintings by Marti Magna, Artist, Hand Painted, Original Paintings, signed artwork, Buy Art Online. 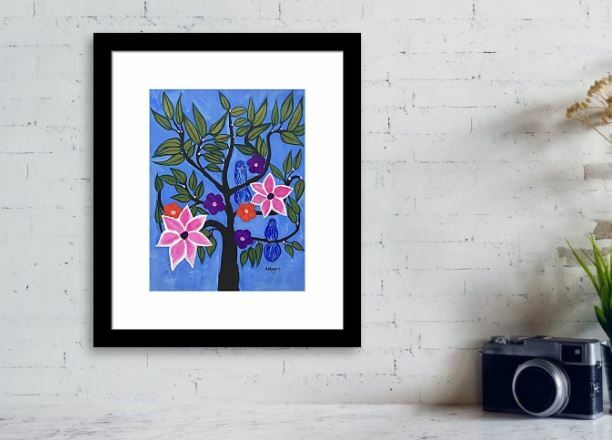 Colorful Wall Art and Prints too!! 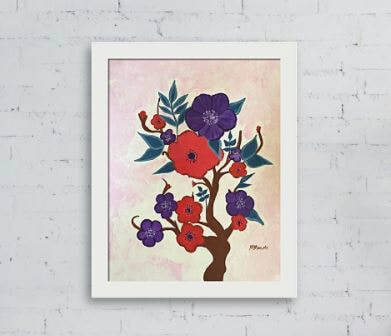 Colorful Abstract Art and Florals. When I finish one of my paintings on paper I wait a few days for it to be completely dry because the next step to finishing the painting is to make sure it's completely flat, so after air drying I put the each painting down on a flat surface and on top of the painting I lay a few really heavy books on it for a couple of days. Currently in the flattening process. I created her with Golden Paints acrylic paint which are the best acrylics on the market, on Acid Free paper. After her flattening process she'll be sprayed with a UV protective varnish to keep from yellowing or fading prior to getting listed onto my website. If you're interested in purchasing this painting before I list it on my website that's fine to contact me and I'll reserve it for you or if you'd like for me to create a custom painting all your own I would be happy to do that too just contact me. I love Mondays because I see it as a new start to the week it's opportunity to accomplish any goals or challenges I've set for myself. I paint on a daily basis but with the Holidays around the corner I'm adding additional hours for painting to my day. Just wanted to share a pic of this painting that's now available on my website. I created this painting on Strathmore mixed media heavy weight paper with acrylics by Golden Paints and finished it with a protective UVA sealer. Thanks for visiting, if you like my paintings please like my FB page and share my paintings with your friends and family. Fall is finally here, Yay !!! That means cooler temps and red wine... you can read what I'm talking about here. 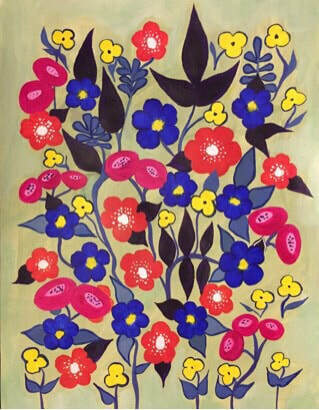 This is one of the painting's from the Vintage Floral Collection. 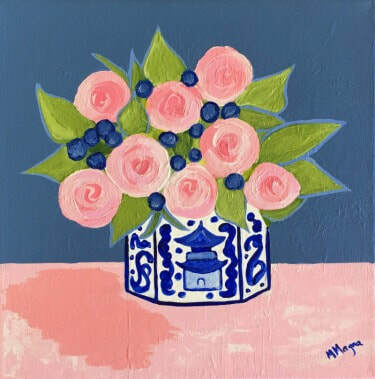 The paintings in this collection are influenced by a combination of Vintage French Chinoiserie and florals. This is a custom painting I created for one of my collector's, measures 18 x 24 inches with custom framing. 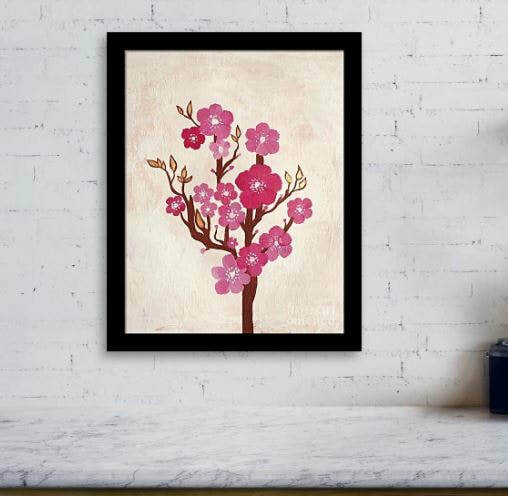 Hanging Cherry Blossoms is 11 x 14 inches and can be displayed in any direction. 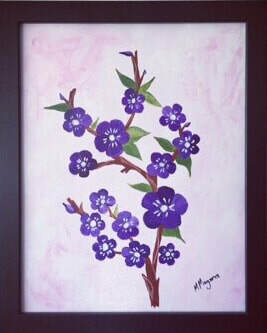 Purple Blossoms, 11 x 14 inches. 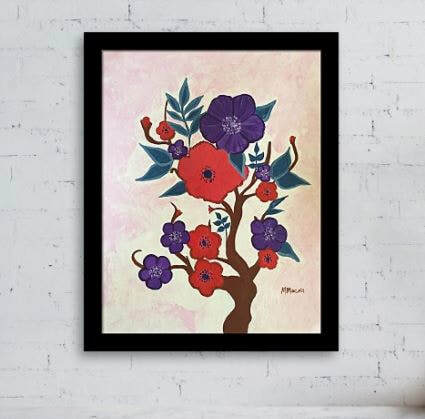 Several of these original paintings in this collection I've created on Mixed Media Paper instead of canvas check out my post about paintings on paper to learn more about works on paper. All of my works on Paper are created with Acrylic Paint, on Acid Free Mixed Media Paper then sprayed with a protective varnish to maintain the vibrancy of the paint and to protect from yellowing. This post is to share my creative thought process and opinion based on my knowledge and experience as an Artist I am not speaking for all Artists', each artist has their own creative methods, knowledge and opinion. When I say misbehaves I mean your painting starts to look dull and not as fresh and vibrant. Or even worse the painting starts to fade, yellow or both. And the absolute worse case scenario is if the paint starts chipping or cracking -Noooooooo !!! 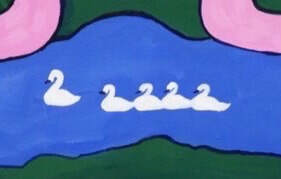 Yep these are signs that your painting the one you purchased was probably created with bad quality paint or even house paint - Eeeeeeeeeeek. 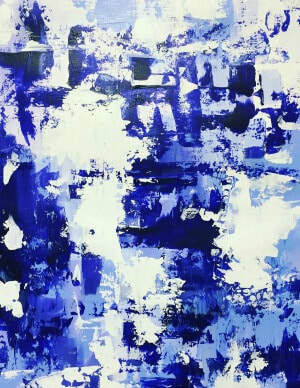 I've read that famous Artists within the past 60 years used house paint, if true or not I can only speak for myself and I personally choose to purchase and paint with Acrylic Paint specifically created for painting on canvas and on paper which has been created with today's technology. 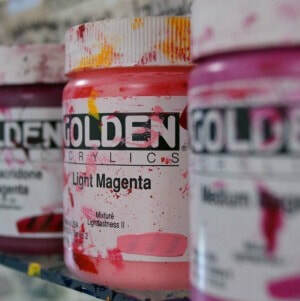 By the way this isn't a sponsored post by Golden Paints I'm just sharing my favorite product line. ​Sign up for my newsletter for free stuff and subscriber only discounts here. So the other day I was asked why I create paintings on paper and thought because I'm asked this question often I felt it was worthy of it's own post. ​I think a lot of people are under the impression that fine art paintings are only created on canvas but the reality is that artwork on paper has been around since the 2nd Century in China where paper was invented. Artists such as DaVinci and other artists of the 15th Century fine tuned their paintings and sculptures by sketching on paper prior to finishing their masterpieces. It was Picasso and Barque who worked with paper and created artwork with collage and introduced us to works on paper and of course Matisse only worked with paper to create his artwork. Fast forward to today and there are several artists including myself who create art on paper. There's also a huge variety of paper available for Artist's to work with depending on the type of work on paper they're creating and there are also various grades of paper for artists to choose from, there's very average paper to high quality (professional grade) paper. Personally I only use high quality, heavyweight paper to create my paintings on paper because I want my collectors to enjoy their paintings for a lifetime. The paper I work with is always high quality professional grade paper which is acid free and purposely manufactured to last a lifetime. In a future post I'll write about why I enjoy offering my paintings on paper to my collectors and the enjoyment that goes into creating my paintings on paper. For further reading I've added a link from Christies. Thanks for visiting, if you have any questions for me feel free to contact me.